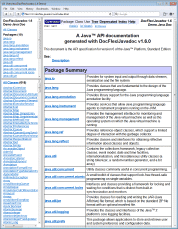 DocFlex/Javadoc is both a multi-format Javadoc Doclet and a programming tool for rapid development of Javadoc-based Java API documentation generators in various output formats. The high quality graphic Template Designer represents the templates in a visual form resembling the output they generate. At the same time, it allows programming of very sophisticated processing of the input data and formatting of the generated output -- features that are possible to develop so far only by direct Java coding! 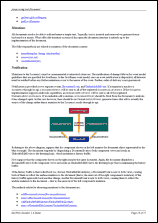 The entire Doclet API is represented in a form of virtual XML document called Doclet DSM (here “DSM” stands for “Data Source Model”), on which the designing and processing of templates is based. 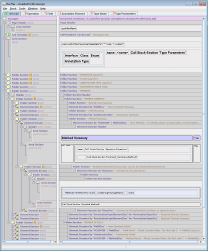 This allows using some of the technologies developed around XML for Javadoc. Most of data mining and retrieval is based on Location Paths / Location Rules, which is a developed extension of XPath. This is complemented with the specifically adapted hash-maps (called element maps) that serve the role of indexes. It also supports the rendering of embedded HTML, which means interpreting in non-HTML output formats (such as RTF) the HTML tags embedded in text data (e.g. documentation comments). Almost all HTML tags practically usable in doc-comments are supported. Hyperlinks can be generated in all output formats that support them (this currently includes HTML and RTF). In RTF, the cross-reference links can be represented also in the form of page number references, which in effect makes them usable even in printed documentation. 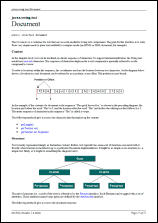 The RTF can be further converted to PDF. It will work for all types of generated documentation equally! 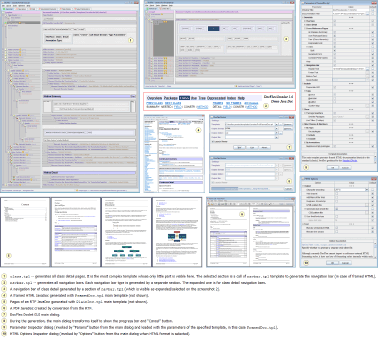 Everything is covered by the same “DocFlex/Javadoc” license, which unlocks all implemented functionality. JavadocPro will work in limited mode. However, that will be enough to generate full-blown framed HTML JavaDoc with the same functionality as provided by the standard Javadoc. Generation of classic JavaDoc with a possibility to exclude any classes and members by tags/annotations. It is rather difficult to implement. To make the generated docs consistent, the excluded classes must be not only be removed, everything needs to be changed as if those classes never existed at all. For instance, the public members of some excluded classes may still be required to appear in the documentation. But in that case they must be shown as if they are defined in other classes, which actually inherit them. It contradicts the very essence of class/member visibility. According to the canonical approach, instead of deriving a public API directly from the implementation, you are supposed, first, to define the entire API in the form of some abstract interfaces and, then, to maintain the actual implementation separately. Of course, real life does not always follows some canonical schemes! 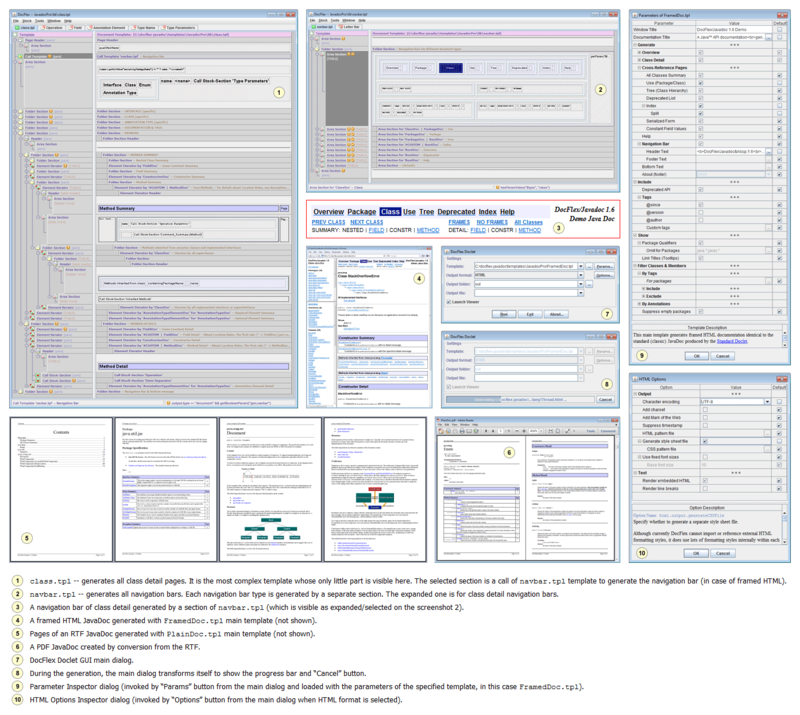 Generation of outstanding quality RTF JavaDoc. Unlimited possibility to customize your Java API documentation. 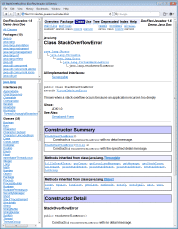 Change fonts, colors and other look & feel of your JavaDoc. Program a complete different JavaDoc generator / utilize your Java project info for whatever else. 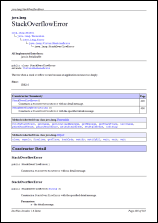 Ultimately, you can program a completely different JavaDoc generator, and even in a different format (particularly XML-based, e.g. DITA) using plain text output. 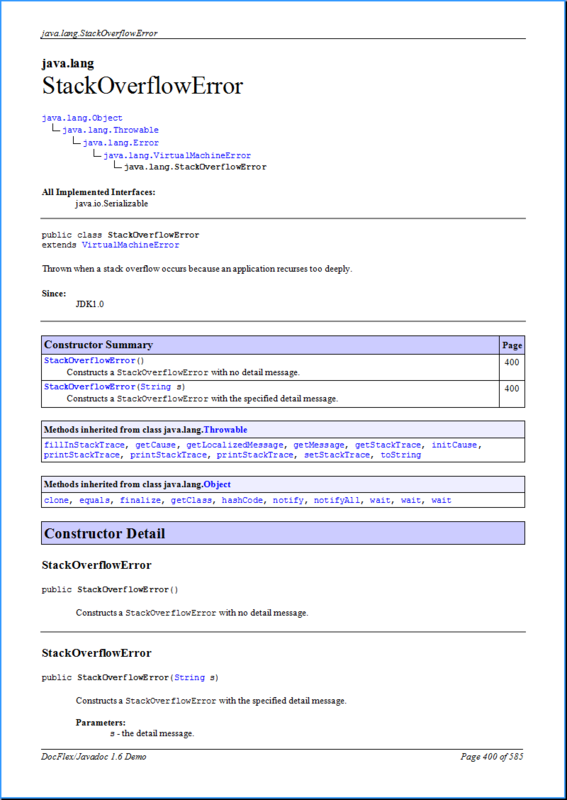 DocFlex/Javadoc can help you also to retrieve whatever information about your Java project (if only provided by Doclet API) so as to utilize it for other purposes -- not only as documentation. 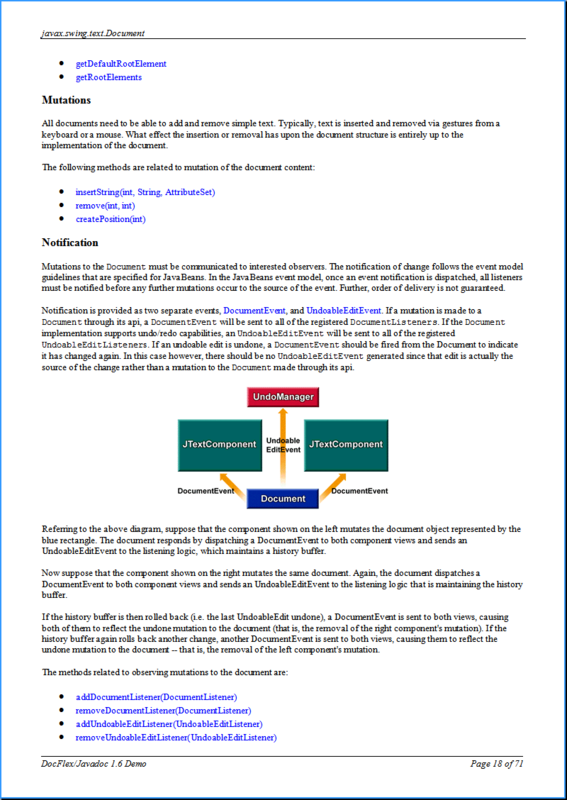 The template-driven documentation/report generator by any data stored in XML files. 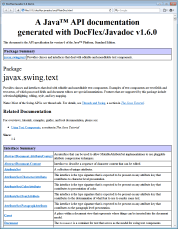 More precisely, it is a development tool (SDK) and a runtime environment (RE) for such generators, the same as DocFlex/Javadoc is for Javadoc doclets. DocFlex/XML XMLSpy Integration -- an integration of DocFlex/XML with Altova XMLSpy®. 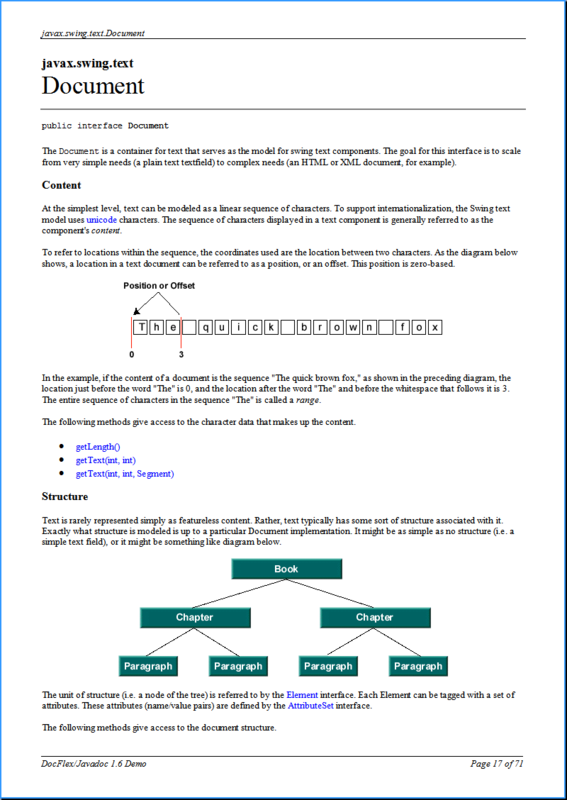 It allows automatic insertion of XSD diagrams produced by XMLSpy into the XML schema documentation generated by DocFlex/XML XSDDoc. 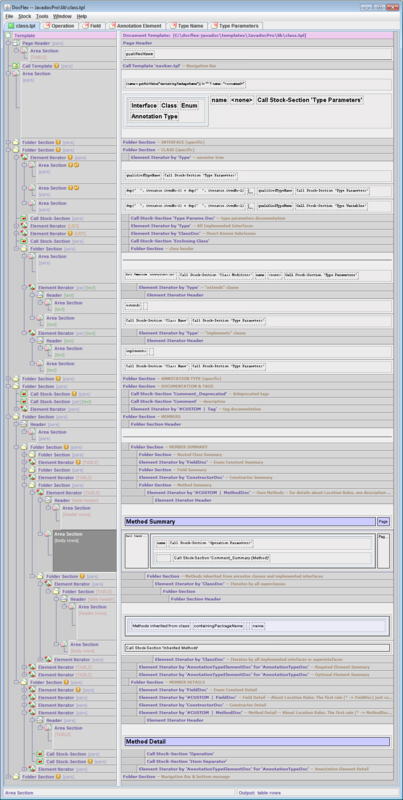 The entire thing (DocFlex/XML + XSDDoc + XMLSpy) works as a single documentation generator. (More similar integrations are coming).